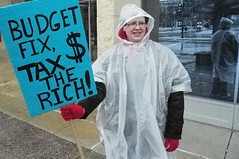 Budget 2013- Taxing the super rich – Is it justified? Burdened with a high current account and fiscal deficit, the government took the easiest way out- and did what other developed countries like the U.S have done to revive the economy and raise resources for the development of the country- targeting the super rich. The budget 2013 has imposed a surcharge of 10 % on those earning taxable income of Rs. 1 crore and above. An estimated 43,000/- people fall in this segment- with a declared income of Rs. 1 crore and above. And most of these are people who are either the salaried class or those who are in the public eye and have sizable assets and businesses and hence cannot afford to declare an income below Rs. 1 crore! But what about the large section of people, mainly businessmen- real estate developers/shopkeepers/stockbrokers who actually fall in this segment but declare only a portion of their income to the government, receive/transact huge amounts in cash, just to evade income tax? In a country which is known for its tax evasive culture, our economy loses crores of rupees in tax revenues every year just because people do not declare their real earnings. About 80 % of the tax revenues of the govt. comes from the top 10 % of income earners. Hence is it really justified to tax those in the super rich segment who have been sincerely paying their taxes every year and have been the major contributors, instead of coming out with strict means and measures to bring the evaders under book? Secondly, if the developed countries tax the rich class at a higher rate, they also ensure that those funds really go towards social welfare – social security measures like financial aid and free medical treatment for the unemployed and the retired. Our country, on the other hand lacks even the basic infrastructure and other facilities to ensure a decent standard of living. Corruption, which is rampant ensures that even the taxes which are collected are not used effectively. So, I personally feel taxing the ‘declared’ super rich is not the real solution. We need to address other issues like corruption and tax evasion first and go after those who are really super rich and have huge amounts of unaccounted wealth and yet get away with paying much lesser taxes. And… all of us can do our bit. Next time you go to your neighbourhood store to buy something and the shopkeeper suggests that you can avoid the VAT (and he can avoid income tax) by not taking a bill, just say NO!